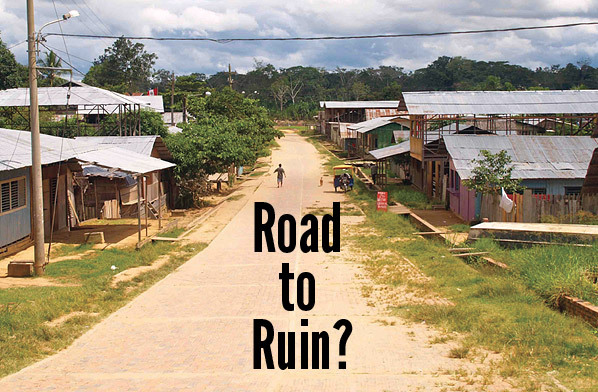 University of Richmond Alumni Magazine-Winter 2013: Road to Ruin? When the Romans, after the rebellion of Spartacus, crucified 6,000 rebellious slaves along a 200-kilometer stretch of the Appian Way, the message was as clear as the highway beneath them: All roads lead to Rome. Whether that network embodied conquest or progress depended largely on your point of view. Centuries later, Vandals, Visigoths, and others would follow those roads back to the crumbling heart of the empire. The roadway as artery of development remains a familiar refrain today, one being sung loudly by Miguel Piovesan, an Italian priest in a town called Puerto Esperanza (above) carved out of the Peruvian Amazon. For more than a decade, he has championed the construction of a 170-mile roadway connecting his town, currently accessible only by charter plane, with wider Peru. Thousands of miles north, in a lab on the third floor of UR’s Carole Weinstein International Center, is one of the road’s unlikeliest skeptics: sophomore George Appling. The soft-spoken 19-year-old with thick, black hair and halting Spanish is throwing the brakes on the roadway project with one simple tool: a map. His map, and the analysis that accompanies it, landed him and his professor in the middle of the debate over this road and the Amazon rainforest through which it cuts, a debate that will also decide the fate of some of the last people on the planet untouched by modern global society. To understand what is meant by such a term, it is helpful to spend some time with reporter Scott Wallace, which a couple of hundred UR students did one September evening in Jepson Hall. Projecting maps and photos on a large screen behind him, Wallace held students spellbound for an hour as he described a grueling 2002 trek through the rainforest with legendary Brazilian explorer Sydney Possuelo, then director of the country’s department of unknown tribes, an office within the country’s National Indian Foundation. Their mission was to document the territory of the flecheiros, or Arrow People, called so because they were known to meet intrusions by outsiders with a hail of poison-tipped arrows. As with all tribes in voluntary isolation, almost nothing is known about them: not their way of life, nor their ethnic group, nor even what language they speak. Such people have been called “uncontacted,” as when in 2011 the BBC publicized dramatic footage of one group filmed from an aircraft flying a kilometer away. On the ground below in a clearing of thatched huts, nearly naked figures in red body paint stare and point at the aircraft above. What they thought of it is anyone’s guess. Uncontacted Indians living in Brazil near the Peru border. This footage was taken from an airplane for Brazil’s Indian Affairs Department as part of a campaign to prove such tribes’ existence and further their protection. But “uncontacted” is a misnomer, as Wallace pointed out to students and in his book The Unconquered. Such tribes have met the outside world, but with disastrous results. The trouble started with the trees around them. Today’s voluntary isolated people are thought to be descendants of Indians who scattered deep into the forests rather than submit. Their contact with outsiders can be just as violent now as when their ancestors fled. The jungles today shelter illegal loggers, poachers, and drug traffickers with well-earned reputations for violence. As recently as August, Brazilian prosecutors filed an indictment accusing gold prospectors of helicoptering into Venezuela and massacring as many as 80 Yanomami Indians. Such incidents explain not only why such tribes avoid contact but also why they recognize the sound of gunfire. As Wallace notes, governments in the region used to pursue a policy of peaceful contact with such groups, leaving gifts of axes and metal pots in the forest to woo them into peaceful contact before less scrupulous forces got to their territories. The results were often catastrophic for the Indians: disease, poverty, dependence, and the destruction of their ways of life. Possuelo, the Brazilian explorer who led Wallace’s expedition to map the territory of the flecheiros, pushed a new policy of avoidance and protection in the 1980s. Create protected areas, keep outsiders out, and let the indios bravos initiate contact on their own time and terms. 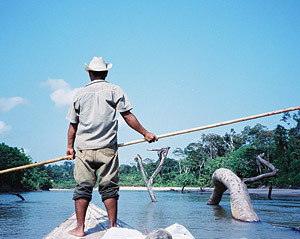 The assumptions of this Brazilian policy were applied in the creation of the Purús National Park and Communal Reserve in Peru. If you’re looking for an antidevelopment crusader, a shaggy-haired, wide-eyed dreamer of an environmentalist, George Appling is not your man. He dresses crisply and speaks with a measured tone that is more scientist than evangelist. He came to Richmond from a large high school in Austin, Texas—“almost as big as UR,” he says—to study business. Appling is also a self-described “huge outdoorsman” with a love of fishing and climbing, so when he looks at the tensions between development and conservation, he seeks balance. Richmond being Richmond, he knew he’d have the opportunity to balance his business major with his environmental interests, which is how he found himself in a seminar on climate change during his first semester. From there, he started thinking about staying on campus for the summer to do research, so he researched professors and blindly emailed a handful of them to ask about opportunities. One of those messages landed in the inbox of geography professor David Salisbury. If you’re interested in a summer project, Salisbury told him, take the geographic information systems (GIS) class in the spring. No promises, but there might be something. The carved paddles, masks, and arrows that line the walls of David Salisbury’s office tell the story of a lifelong love of maps and travel. Salisbury spent the summers of his youth as a camper and then counselor in the Appalachians, and in college traveled to Spain and Morocco before signing up for a two-year stint with the Peace Corps in Guatemala. He came back to a job as a teacher and coach at a well-heeled Maryland prep school but kept traveling, primarily to Central and South America. The temptation to dive into a career that would keep his head, and sometimes his body, in the Amazon would prove too much to resist. In graduate work at the University of Florida and then the University of Texas, he discovered a natural academic home for his fascinations: geography. Along the way, he added fluency in Portuguese to his Spanish and focused his interest on that part of the Amazon that straddles the Brazil-Peru border. As part of his doctoral research, he traveled by helicopter, on rivers, and along trails used by indigenous forest dwellers, smugglers, and drug traffickers to help map a proposed national park. Maps, he would come to conclude, meant more than information. They were tools of power. “Blank spaces on official maps could represent a state strategy of ignoring resident indigenous populations in order to maintain remote lands for national resource exploitation,” he wrote, citing another researcher, in the introduction of his dissertation. George Appling didn’t know any of that when he walked into GIS class that spring and then signed on as Salisbury’s summer research fellow. He didn’t know the first thing about Peru, its ecology, or its indigenous people, let alone ones in voluntary isolation. “I would never have thought there might be people like that anywhere,” he said. Using sophisticated GIS technology and a database built over many years, he spent the summer working with Salisbury in the spatial analysis lab painstakingly constructing maps of the proposed Purús road’s route. They got help and steady updates about the road project from partners at the Upper Amazon Conservancy in Peru. After 11 drafts, he produced a research poster with the most detailed spatial analysis of the Purús road project that anyone had ever attempted. On his map, the road looks innocuous enough. 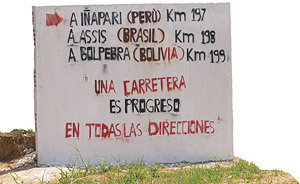 From Puerto Esperanza, where the Italian priest lives, a red dotted line runs straight south and then wraps generally east around the Brazilian border to another dot on the map called Iñapari. Roadways from Iñapari radiate out into wider Peru, as well as nearby Brazil and Bolivia. A second version of the map is more ominous. 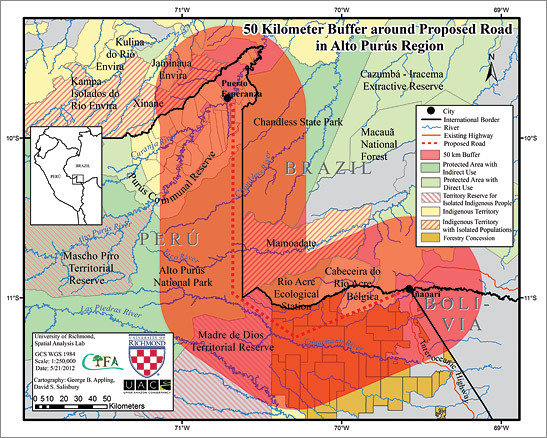 Studies show that in the Brazilian Amazon, two-thirds of deforestation has occurred within 50 kilometers of paved roads, so Appling has shaded a 50-kilometer buffer zone around his red dotted line to illustrate just how far-ranging the road’s effects could be. Throughout this zone, the road could disrupt migration patterns, introduce pollutants, invite invasive species, and facilitate transport of drugs, timber, wild animals, and other contraband. The effects cross national boundaries. Of the 103 rivers and streams the road crosses, 69 percent flow into Brazil, the rest into Bolivia; 40 percent of the entire buffer zone is in Brazilian territory. The effects also cross other boundaries. Nearly 30 percent of the buffer zone covers titled indigenous territories or territory reserved for isolated populations. Appling’s poster also weighed the economic and national identity arguments being put forward by the priest, politicians, and others supporting the road. At $1 million per kilometer of construction costs, plus maintenance on top of that, it didn’t make economic sense, he concluded. It wouldn’t build Peruvian national identity when 80 percent of the Purús population opposed it and the road would invite outsiders and lawlessness. When they shared the analysis with Peru’s Ministry of the Environment, the Upper Amazon Conservancy, and other Peruvian partners, they got in return gratitude, compliments, and before long, a stunning invitation: Would they come to Peru’s capital, Lima, in two weeks to present their findings to the Peruvian Congress? For Appling, the trip to Lima was a blur. At a five-hour session in the legislative palace, he found himself sitting on a congressional panel with an indigenous woman in a headdress explaining the harm the proposed road would bring to her people. The congressman sponsoring the road bill was there too, waving a copy of the constitution at them—“I think he was looking for a photo op,” joked Salisbury—plus numerous activists, government ministers, and others. Appling, whose Spanish is passable but not dexterous, mostly looked on and took it all in as Salisbury walked through their research. Before the pair left, they would also meet with the U.S. Agency for International Development at the American embassy and with the Nature Conservancy, a local partner. Appling stayed a day longer than his professor, using the time to wander around markets and take in the local culture. He had arrived in the wee hours of a Friday morning; by Monday afternoon, he was back on campus. Whether the road will be built remains a political question as unpredictable as the winding path of the Purús River. If Appling’s analysis helps preserve the region’s biodiversity and the people who depend on it, he’ll be able to point at a map and say that a place he’s never been and a people he’s never seen will remain, for the time being at least, beyond the legacy of contact, decimation by disease, extermination by violence, labor exploitation, and loss of culture that have shaped the experience of indigenous people throughout the Americas since Columbus arrived in the 15th century. They will remain in the forest, a vestige and a mystery. In turn, they will know nothing about his efforts, his world back in Richmond, or even him. Matthew Dewald still carries in his wallet the 1,000 cruzados note he carried back from a monthlong trip to Curitiba, Brazil, more than two decades ago. Send comments about this story to magazine@richmond.edu.